HARD HITTING DETROIT LIONS FORUM - View topic - Early Prospect want list. Re: Early Prospect want list. Id be okay with Evans, as long as he is professional and is a hard worker. Hoping Manziels party first attitude didnt rub off on Evans. If not Watkins or Evans, I like Calvin Pryor at 10. Normally, I would say Id be all for them trading up for Watkins, because he is EXACTLY what this offense needs, but with our glaring needs at FS, C, and potentially TE, trading up wouldnt be wise. Then again, they could fill some of these in FA. Agree with conversion02's statement " After Watkins, I don't see the #10 overall value at wr "
I don't see Evans as top ten value with the abundance of other wide-outs available in this draft. I too like Pryor, but have to see how he runs tomorrow. If he runs well and looks fluid in other drills, I wouldn't be surprised to see him climb on big boards. Top ten? Maybe. As for the other possible needs you mentioned, a center in the 3-5 area to groom should be a priority IMO. I wasn't overly impressed by any of the TE's. At least not enough to consider one in the first couple of rounds. As for the WR's, I like Odell Beckham and Brandin Cooks if they're still around in the 2nd. Jordan Matthews in the 3rd. Evans ran well for a big receiver, just not sold on him as being the 10th best player in the draft. I would like to grab either Justin Gilbert or Mike Evans with our #10 pick. If we grab Gilbert try to move up or hope he falls and get Kelvan Washington in the 2nd Round. I also like that Joe Janis kid from SVSU in the 5th as a 3 WR. (3rd Best FS or Center) (4th Rd best what we didn't get in the 3rd) and (6th Rd, if he falls Thomas QB from V-Tech as a project and back-up). My favorite TE in this draft (Austin Seferian-Jenkins) fractured his foot. Hes out of the combine and most likely Washingtons Pro Day. Bummer. I'm really hoping we stay away from mike Evans. I don't know what it is but I think he has huge bust potential. I'd be a lot more comfortable with Jordan Matthews, Allen Robinson, Kelvin Benjamin, Davonte Adams, marquise lee, or even martavis bryant or L'Damian Washington in the later rounds. I think at this point Id want the Lions to go FS in round 1 (Pryor), then address WR in FA and round 2, then C in round 3. Torrey Smith and Randall Cobb both came from the second round and this is a deeper WR class than in 2011 when they came out, so I have little doubt they can find a solid contributor there. As much as WR is a need, FS is just as glaring IMO, if it wasnt before. I viewed most of the combine the last few days, and believe that Justin Gilbert could be the first D-back off the board. Possibly at ten? Looks like he could be in consideration of top ten talent. I moved him ahead of the top safety considerations after their pedestrian 40's. If Watkins and Mack are gone, and we have to choose from the next best receiver or the top DB, don't know which way I would lean on that decision. I have been wanting a CB in the1st round for over a decade. And I might finally get it. I am just not sure that Gilbert is a shut down CB. He has the most potential to be a shut down CB in this draft though. I don't think Denard fits our defense as he is more of a 3-4 blitz CB. Not sure how he would translate to our defense. Last year Warfod was the player I most wanted in the 3rd round. This year, I want CJ Fedorowitz. Agreed on this. He could replace Pett within a year if he leaves, or be a compliment to Pett with both on the field at the same time. If pett holds onto a ball it would be like when Brady had Gronk and Hernandez catching passes, except both could block also. Neither guy moves like Hernandez did. Hernandez was an H-back, HB, and a WR with the Pats. Having Gronk and Fedorowitz would be redundant since they are both just traditional balanced TE/H backs and they already have Fauria and Williams to be the roleplayers at TE. I wouldn't pass on the kid in the 3rd but he probably wont fall that far and if they do get him after resigning Pett it'll make the money used on Pett a huge waste. While neither of them is as fast as Hernandez, it doesnt change at all the fact that they could line up in a 2 TE set, and effectively have 7 blockers on the Line, or run both on Passing routes, and the other team wont be able to easily predict which. Inf act it would allow them to do things even the patriots couldnt do with their 2 since they both didnt rock the block. Traditional tight ends have their advantages, especially as they become more and more rare. The Detroit Lions have major needs at wide receiver, and the best pass catcher in the draft is Sammy Watkins, so it stands to reason that the Lions would be well represented at Watkins’ pro day today. 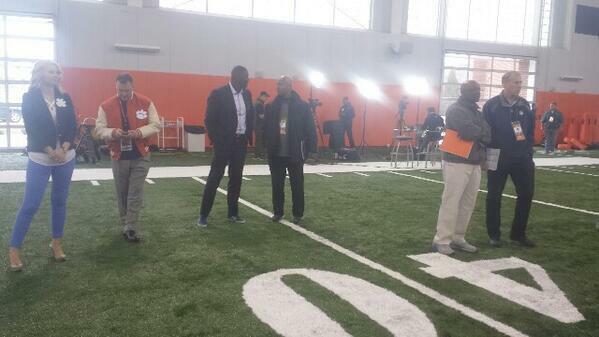 ESPN’s Josina Anderson posted a photo of Lions general manager Martin Mayhew and coach Jim Caldwell at Clemson’s pro day. Scout Dave Sears also is in attendance. Watkins, who caught 101 passes for 1,464 yards as a junior last fall, was the star attraction at a workout that drew representatives from every team in the NFL. He ran routes and caught passes for quarterback Tajh Boyd but didn’t run the 40-yard dash, standing on his time of 4.43 seconds at the NFL combine. Watkins is considered the top available receiver in the draft. He’s got sticky hands and a sprinter’s speed to turn a simple swing pass into a long touchdown. The Lions have the 10th overall pick in May’s draft, and might have to trade up if they want Watkins, who has been compared to recent instant-impact receivers such as A.J. Green and Julio Jones. Among the other general managers to attend were Les Snead of the St. Louis Rams, Doug Whaley of the Buffalo Bills and John Idzik of the New York Jets. St. Louis picks second and Buffalo ninth. Jets coach Rex Ryan, whose son Seth is a receiver at Clemson, said he’d like to add a wideout to the roster and coveted Watkins. “But there’s no way he’ll be there” when New York selects 18th. Watkins has several NFL meetings and individual workouts lined up over the next several weeks. “I’m getting ready to travel the world,” he said, smiling. For now, the 6-foot-1, 205-pound receiver says he’ll fine-tune his route running and focus his mind on making as big a splash in the NFL as he did at Clemson when he was an All-America as a freshman. He doesn’t care who picks him. “I’m willing to go to any team and try and have that instant impact,” he said. Watkins, who gave up his final college season for the pros, set Clemson marks last season with 101 catches for 1,464 yards, both school records. He left with a flourish, catching 16 passes for 227 yards and two touchdowns in the Tigers’ 40-35 win over No. 6 Ohio State at the Orange Bowl this January. Texas A&M’s Mike Evans, the second-best receiver prospect in the draft and another first-round possibility, has his pro-day workout scheduled for March 27. Don't sweat it. The Vikings can not afford to draft anything but a QB in the 1st round. Not to mention I think he doesn't last past Oakland and could go as high as #2 to St. Louis. I know the Rams, Browns, and Raiders all might have bigger needs but Watkins has legit elite potential while the QBs aren't even boom or bust, but okay or bust. The Rams could go LT but have another pick later and Fisher is hell bent on sticking with Bradford so he is going to need as much help as they can get him. The Browns could gamble on Manziel or use their later 1st rounder on Carr and take Watkins and have a potent WR combo for Carr. The Raiders have a ton of holes and none of these QBs are going to elevate them like Watkins could. They would be better off drafting Watkins if he were still there spend big on FAs and wait until next year to get the QB. If I were any of the really bad teams that need a QB I'd wait until next year and get into the Hundley, Winston, and Mariota sweepstakes.